More and more homeowners in the Dallas-Fort Worth area are transforming their backyard into a functional space for the whole family by having a patio or outdoor living space installed by a professional patio design companies. At Compass Outdoor Design, we specialize in outdoor and patio design, and in this blog, we are going to cover what outdoor living spaces are and some of the benefits that they offer. What Exactly is An Outdoor Living Space? An outdoor living space is different from a typical landscape because they offer much more comfort and functionality, encouraging people to spend time outside doing things they would normally do inside. Building an outdoor living space can extend your home to the yard. It can be as simple as a covered patio, or can be as luxurious as a dining room. If you have been wondering what all the hype is about outdoor living spaces, check out some of the benefits that they offer. Maybe people think of patios and outdoor living spaces as a separate area from their home. Instead, they should be thought of as an extension to your home. You can choose how simple or extensive you want your space to be, making it seem like just another room. What’s more, you can take many indoor amenities to be used outside, from a functional outdoor kitchen to a fireplace for the ultimate relaxation spot during fall nights. When you have a luxurious outdoor living space, hosting family and friends for get-togethers or dinner parties isn’t as tedious or difficult to do. You’ll be amazed at how investing in your outdoor living area facilitates an exciting environment and creates memories that will last. There’s nothing that will increase the value of your home quite like a well-designed patio with a outdoor fireplace and kitchen. You can expect a solid return on your investment on your outdoor living area, especially if you put enough time and creativity into the design of your outdoor area. When you decide to put your home on the market, potential buyers will be picturing themselves relaxing or having an evening dinner on your patio! Believe it or not, outdoor living spaces can encourage healthy eating. Whether you cook over an outdoor gas grill or use a grill that is built into an outdoor kitchen area, grilling is one of the healthiest ways to prepare a meal. Throw some meat and vegetables and the grill to create some delicious and nutritious meals! Back in the day, a lot of our time was spent outside, especially when the weather was nice. However, with technology and other factors, today, our time spent outdoors is minimized. Having an outdoor patio in your yard will encourage you and your family to spend more time outside. Studies have proven that time spent outdoors can help reduce stress, boost your immune system, and improve your mood! Listen to birds chirp, gaze at green trees and plants nearby, bask in the sun, and enjoy the great outdoors! These are just a few of the many benefits that outdoor living spaces and patios in Dallas offer homeowners. In order to build the patio of your dreams, you need to work with the right company. Compass Outdoor Design is one of the leading landscaping design companies in Dallas. Specializing in covered patios, luxurious outdoor living areas, outdoor kitchens, and other high-quality projects. 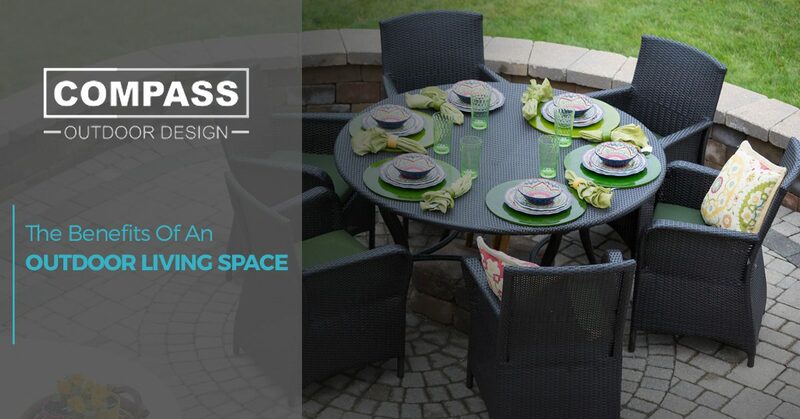 To learn more about our patio design services or to receive free information, contact Compass Outdoor Design today!